Any visitor to San Francisco with any eye for architecture knows the basic spots to see. The Golden Gate Bridge and City Hall. The Transamerica Pyramid — honest! — and the Ferry Building, which will outshine anything in its short-term Embarcadero neighbor, Super Bowl City. Beyond that? There’s more than you might think. This city is not Chicago, fabled for individual structural masterpieces. Instead, it’s the embodiment of the urban reality the atmospheric whole of a neighborhood is greater than the sum of the too-often nondescript parts. But it is studded with more architectural gems than you might think, a heartening number of them from the past 15 years. Here are 10 worth seeking out. And even if you’re from here, there will be some surprises along the way. The rebirth of the Embarcadero since the Loma Prieta earthquake in 1989 isn’t confined to the those wide-open views where an elevated freeway once stood. This trio of piers blends painstaking historic preservation with careful new construction — adding up to a stately arched wall facing the city, behind which there’s a compelling weave of pedestrian paths along the bay. Hannum Associates and Tom Eliot Fisch, with Page & Turnbull on historic preservation, 2006. Third and King streets, HOK Sports, 2000. In a 2010 visit here, Pulitzer Prize-winning architecture critic Paul Goldberger declared this one-block oval to be “my new favorite place.” No wonder. Developed in the 1850s as an elite enclave, within decades it was a forlorn backwater. Now it’s a cafe-lined mix of buildings from subdued to cutting-edge. The central green fills with tech workers on weekdays, young families on the weekend. Between Second and Third, Brannan and Bryant streets. Truly civil high-rises are rare, and they deserve our respect. This unapologetically modern tower of limestone and glass is five stories at the corner and 26 stories on the skyline, at home amid older neighbors and strong enough to stand out among newer all-glass shafts nearby. The corner is a spacious tall room open on weekdays to the public with glass walls that pivot open on sunny days. This telescoped wonder near Market Street is my favorite among the city’s handful of Jazz Age towers. The sidewalk is an irresistable gleam of sandy terra-cotta panels around a delightfully grand entryway framed in scalloped bronze grillwork; 28 steep stories later, the streamlined shaft culminates in a skyscraping crown adorned with statuesque castings of, yes, shells. 100 Bush St., George Kelham, 1929. Our most important work of 20th century architecture may be this seven-story piece of a busy Financial District block. The outer wall of clear glass within a steel frame was the nation’s first glass curtain-wall, forerunner of towers that gleam on countless skylines. After a meticulous restoration completed in 2013, the notoriety is obvious: With stone buildings on either side, the effect is startling once again. 130 Sutter St., Willis Polk, 1918. Three short blocks from the Hyde Street cable car is a scene that truly could be found nowhere else: a quartet of linked cottages along a brick alley. While the Tudoresque ensemble would be enchanting anywhere, what makes it memorable is the juxtaposed setting — a 31-story tower concludes the alley, while a few hundred yards to the east, a snug lawn beckons with matchless hilltop views. Off Vallejo Street, Willis Polk, 1916. 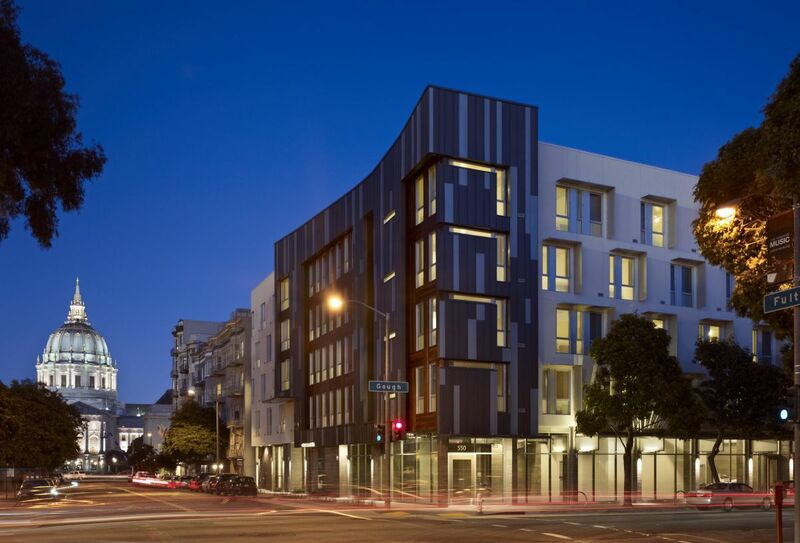 The Bay Area excels at topflight contemporary housing for low-income residents, and this is among the best of the best. Four stories of apartments sit atop tall storefronts on a busy corner two blocks from City Hall, wrapped in an energetic collage where perforated aluminum sunscreens slice shadows across lime-green stucco walls and the corner could be a zinc-clad prow. Fell and Fulton streets, David Baker + Partners, 2012. Of our three recent buildings by winners of the vaunted Pritzker Architecture Prize, this is the one to see. Even if you find the copper-clad exterior to be a forbidding presence in Golden Gate Park, every facet of the interior is alluring and calm. The final seduction: an observation tower rising like some abstract diaphanous beast above the trees, free to all and difficult to leave. 50 Hagiwara Tea Garden Drive, Herzog and de Meuron, 2006. This clubhouse of sorts for the Golden Gate National Recreation Area is an exhilarating surprise at continent’s end, a muscular redoubt on a rugged cliff. Though modern and brash, it fits the site — the thick concrete frame shrugs off wind and fog coming in from the ocean, while the 14-foot walls of glass preserve ocean views from the east. John King / The Chronicle. 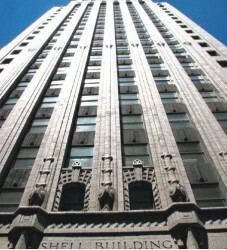 The 28-story Shell Building on Market Street is one of San Francisco’s handful of Jazz Age towers. 680 Point Lobos Ave., EHDD, 2012. John King / The Chronicle The 28-story Shell Building on Market Street is one of San Francisco’s handful of Jazz Age towers.